Which breakfast cereal makes the most delicious cereal milk? Gird yourself. Hold onto something steady. 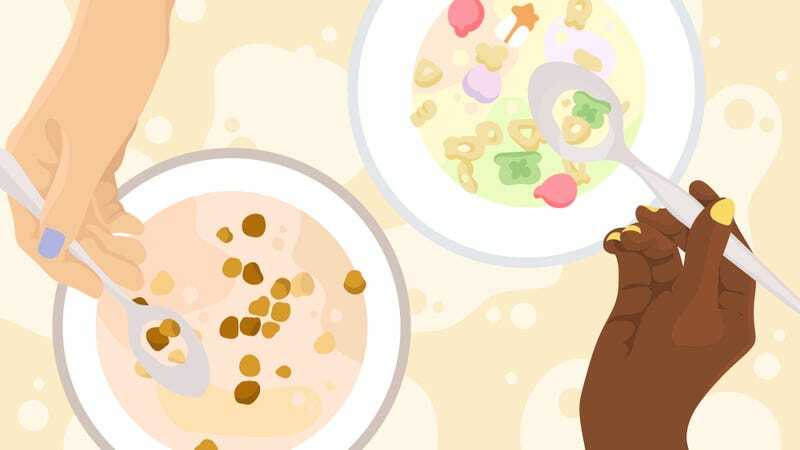 The following statement may make sensitive readers uncomfortable and angry: The best part of breakfast cereal is not the cereal itself, but the cereal-steeped milk left in the bowl. This taste test was inspired by Milk Bar, the desserts and pastry chain based in New York City from the Momofuku Restaurants empire. One of the beverages they serve is, in my opinion, a genius stroke of culinary marketing: A pint of whole milk flavored with corn flakes cereal. It’s creamy, sweet, a touch salty from the corn powder, and altogether evocative of childhood. For about $5 they sold you nostalgia in a bottle. Homemade cereal milk should cost you a lot less. So it had us thinking: If we were to judge a cereal solely based on how it flavors the milk, which would come out on top? The Takeout assembled eight of the most popular breakfast cereals, steeped it in whole milk, and tasted the result with a panel of esteemed cereal enthusiasts. Colored the milk an orange cream tinge, the color of a light Dreamsicle. About 85 percent of the taste imparted is cinnamon, while 15 percent is apple pie. Tastes autumnal, though not sure autumn flavors work with milk. The milk here tastes like froot. Not fruit, but froot: a genus that skirts legal definition of anything grown in nature. Requires the crunch of cereal to make the taste work. But the steeped milk by itself tastes artificial, like discount candy at the dollar store. Outstanding. The appeal of Milk Bar-style corn flakes milk, with the velvety sweetness of vanilla. Underscores the “cereal” in cereal milk. The problem here is you’re expecting great Hershey’s chocolate milk, but instead, you’re only getting the suggestion of chocolate milk. It tastes of milk but as if someone only added a quarter of the recommended amount of chocolate powder, with some corn cereal flavoring. The disappointment is in your sky-high expectations. Synthetic. Straight-up candy milk. But you know this tastes exactly like? Strawberry Quik. Now here was a surprise: Honey Nut Cheerios milk tastes like a sophisticated dessert served at a fusion Japanese restaurant. It has a mellow through-line of sesame, an appealing bit of burnt flavor. Churn this into ice cream and this could be a $12 pint at Jeni’s. We’re serious. Milk steeped with Cinnamon Toast Crunch is a more dairy-forward version of horchata—like melted churro ice cream. If you enjoy cinnamon, this isn’t bad. Here’s another surprise: Lucky Charms milk doesn’t resemble Lucky Charms. It’s a semi-interesting mishmash of flavors, with rice in the forefront, vanilla marshmallows on the backend, with notes of black sesame and salt. How much does Halo Top taste like full-fat ice cream?